アサデス。九州山口で当店が紹介されました！ Kachoshi is gonna be on TV! Kachoshi is going to go on TV! The TV crew featured the high quality beef we serve. Especially, Chateaubriand from Shizuoka prefecture drew their attention (picture above). 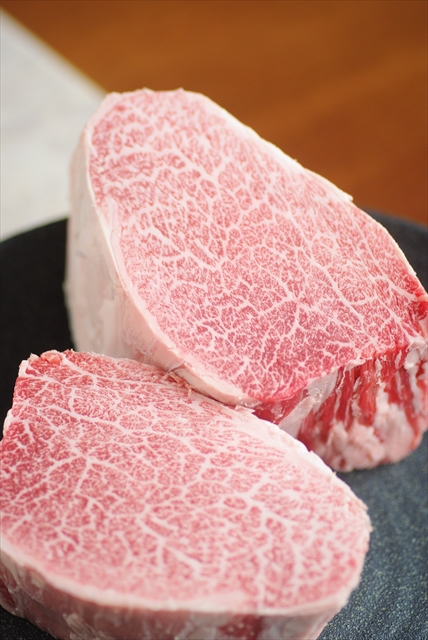 It is female beef with the most beautiful marbling I have ever seen. The reporter, Mr.Nakano, was stunned as soon as he took a bite of it after being broiled. Now we can offer the best fillet in Japan. Tattobi grade, chateaubriand course, is 7020 yen including tax. Sora grade, fillet course, is 5724 yen including tax.